Fall is just around the corner. We hope your summer has been filled with family, fun, and friends! The Plano quilt show was a great success. 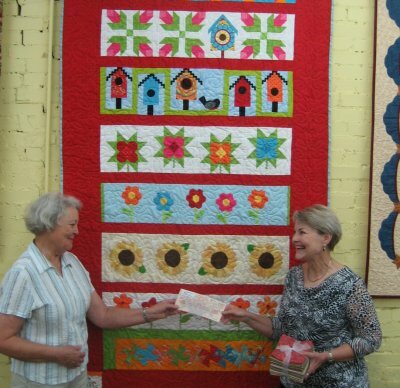 (Don't forget the quilt show in Sulphur Springs will be Sept. 19th&20th. Their raffle quilt won a ribbon and judges choice!) If you were not able to make it, you missed some beautiful quilts. 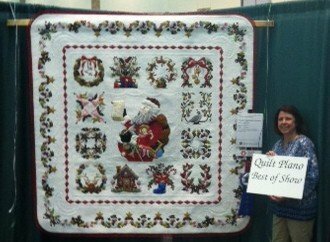 Linda Neal's "Twas the night before Christmas" quilt won Best of Show and Viewers Choice. This amazing quilt is going places for sure. Linda uses the P3 freezer paper starch method SO join the class in October and you can learn to do it! We have enjoyed meeting many new quilters since we are participating in the Row by Row experience. We now have a winner and she used our row in her quilt! 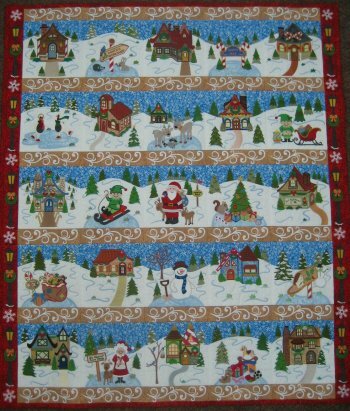 Brenda Jeschke Embroidery Retreat September 5th-7th Project-Christmas Town by Anita Goode Designs. This retreat is for those of you that are comfortable using your embroidery machine but would like to learn skills to improve the end results and to simplify the process. Brenda is happy for you to work on any project with any machine. She is here to help with any issues you may be having with any project in your UFO stash. "Christmas Town" was a huge success at the Plano quilt show. See below. Brenda Jeschke day class Saturday Sept. 6th from 9-6. Don't have time to spent the whole weekend at retreat? Come join us for Saturday only-$55. This class is for those of you that are familiar with your machine and use it upon occasion. Work on project pictured above or any embroidery design of your choosing. Five spots open for this option. Give us a call or e-mail asap. Want hands on experience? Jackie is offering an afternoon class from 1:30-3:30 for $35 per person. Jackie will focus on Feathers! You have seen her awesome work- come learn from a master quilter. Limited to six students. Sign up now! September 18th-21st Quilt Mercantile Fall Retreat. We have a few openings in our retreat. E-mail if you would like to join us. Eileen Urbanek retreat November 14th-16th teaching Judy Niemeyer- any pattern. She is a certified educator and is absolutely wonderful with tips to simplify the process. Brenda Jeschke Embroidery Basics Retreat December 5th-7th See description below with day class. She will go through all this and have you work on some basic blocks and techniques at retreat. Basic Embroidery Machine class by Brenda Jeschke Dec. 4th from 10-4 for $45. We are so very excited about the success of Brenda's first class and retreat at our facility. If you want to use your embroidery machine (any brand) this is the class you have been waiting for!!! Brenda will teach you how to use the embroidery part of your machine. Any brand! This class covers using the proper stabilizers, how to hoop properly, discuss needles, threads, and bobbins, machine embroidery formats, printing templates, getting your designs to your machine, downloading designs from the internet, and design organization on your computer. Bring machine and laptop. We are very excited to have this brand new offering. Do you have a embroidery machine you have never used??? Bring it out of the closet and join this class. THEN you can learn more when she comes again for another retreat December 5th-7th! She has some gorgeous samples hanging in our store. Jackie Brown Domestic Machine Quilting Retreat Dec. 12th-14th. Jackie will spend the weekend with you teaching skills needed to succeed at quilting on your domestic machine or sit-down quilting machine. See retreat center link below for more information on retreats. See quilt store link for class information. OR send us an e-mail.